Gnats will ruin a bike ride or a run. They’ll get in your mouth when doing either activity, and completely disrupt your workout. They’re tiny and irritating and I’m already usually in a bad enough mood due to exercising. Gnats, as part of the fly family, are found in every region of the U.S. Most are outdoor dwellers, but sometimes gnats will get in to be near the lights or your houseplants. Either way, you should find out how to get rid of them. While both are tiny and both are irritating, and both like garbage cans, gnats don’t eat rotting food or produce. 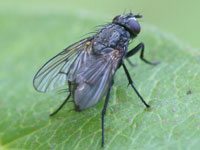 Fruit flies are a different beast, and this article here will help you if those are your problem. For these things, also known as turkey or buffalo gnats, you’ll want to try a fogger. They’ll appear between late Aprila nd July, usually. Pyrethrin-based foggers, like Raid Yard Guard Outdoor Fogger and Spectracide Bug Stop Insect Killer (which Amazon sells here), are an efficient way to temporarily reduce the number of black flies near your home. You’ll want to keep this stuff away from animals, like cats, since they’re sensitive to them. To get rid of fungus gnats, check out that article and/or dry out your houseplants. 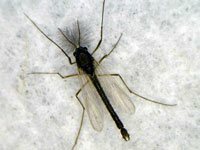 Fungus gnats breed in soil and feed off of plants, and they thrive in the wet, warm soil found in houseplants. Mosquito spray is the best thing to keep these things away from you. They tend to swarm around our faces and get into eyes/mouths. They don’t bite, but tend to spread pink eye because of their feeding habits (secretions near the eyes of animals/humans). 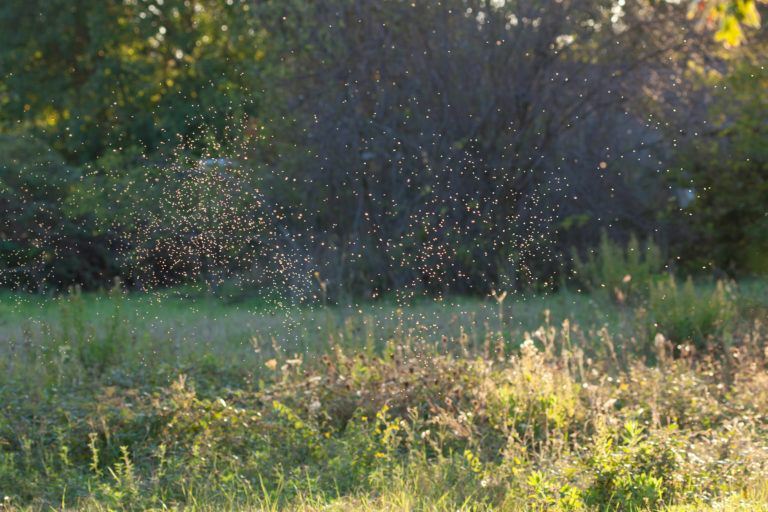 They’re not easy to control, but DEET containing repellant will keep them off. To get rid of midges, turn off the outdoor lights (they’re attracted to the light). They breed in water, but get into houses through screens and improperly sealed windows. Without the light to attract them, though, they shouldn’t be too much of a problem. You could also try sodium lights as they’re less attracted to them. You can find a wide variety of sodium lighting products at Amazon. It’s pretty easy to create a apple cider vinegar gnat trap. Basically cut off the top third of an empty round plastic bottle (a 2-liter bottle works best). Put in about a half cup of apple cider vinegar, a couple drops of dish soap, and enough water to bring the fill up to halfway. Flip the top third upside down and tape it on. THe gants will go down the funnel but not be able to get back out. Vanilla will work for a temperory repellant, provided it’s 100% pure (no added sugar/corn-syrup). Just mix about a tbsp vanilla with a cup water and then put on clothes/body. The live herbs are great, both inside and out. Citronella candles will also work to keep the gnats away. You’ll want the screen to be small enough to stop gnats and other “no-see-ums” from getting inside. They’ve got a fine mesh. Check out Home Depot or Menards for this screen material, and replace to stop gnats. Gnats are small, and they are persistent. They will find the small holes/cracks to get inside. Be sure to repair holes in screens or walls to ensure that they can’t get in. 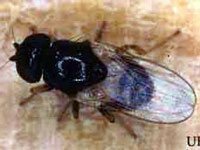 Fungus gnats come in with soil, sometimes. Consequently, houseplants may be carriers. So, to help protect against that, use only pasteurized potting soil. The process kills any microorganisms that feed the gnats, and the gnats themselves. Be sure to protect unused soil from contamination! If you’re bringing plants inside, you should probably keep them separate from your other plants/dirt/housing stuff for about 7-10 days. This will help ensure that you either spot the infestation before hand, or ensure that they don’t have one. Tiny white worms on the soil and gnats hovering tend to indicate an infestation. Dry out the plants/rake the soil to kill the larva. Once you’re clean for a week, you can bring the plant in.